Dog isn’t this man’s best friend. Josue Herrios-Coronilla, 18, drove his black Camaro on the wrong side of the road Wednesday and crashed into the yard of man who owns four dogs, police said. Police found crushed bushes, a damaged fence, an inoperable car — and a fresh shoe print in a pile of dog feces. Following an odoriferous trail down the street, Sgt. Dale Gunter noticed a white van driving toward him. When he asked the passenger to step out, he noticed the smell of alcohol on the man’s breath and evidence all over his shoes. Two British adventurers drove to Timbuktu and back in a truck fuelled by chocolate. Andy Pag, 34, and John Grimshaw, 39, made the 2,600-mile trip in salvaged Ford Iveco Cargo lorry and Land Cruisers, using biodiesel made from waste chocolate. 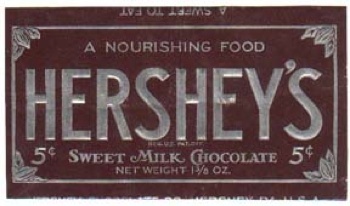 The image is of the design of the five cent Hershey Bar wrapper used from 1927 to 1932. An Austrian con man lived in hospitals for three years after tricking more than 90 clinics into admitting him with fake illnesses. Jobless Franz Steiger, 59, from Muerzzuschlag, treated the hospitals like a hotel and stayed in 93 across the country. But he was caught out when he claimed he had been suffering from dizzy spells after being knocked off a motorbike – and examining doctors grew suspicious when they could find no other injuries and checked with other hospitals. Two men have been arrested in New York for wheeling a dead friend through the streets in an office chair and trying to cash his cheque. David Dalaia and James O’Hare, were seen pushing Virgilio Cintron’s body from their Manhattan apartment to a check-cashing store a block away. The men left Cintron’s body outside the store, went inside and tried to cash his check, worth about [$320]. The crowd gathering caught the eye of an off duty detective who called a couple of uniformed officers who promptly arrested these two rocket scientists. No elephants for pets in the UK! The British government has denied a petition from a 12 year old boy (signed by over 600 others) to allow pet shops to sell elephants. 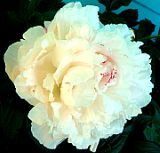 January 10, 2008 Posted by oldstersview | animals	| Comments Off on No elephants for pets in the UK! The squirrel thought it was a serious problem. Hundreds of residents in Parsippany and Hanover [New Jersy] lost power for nearly an hour Tuesday afternoon after a squirrel came into contact with a power line at a substation in Hanover. No serious problems were reported, but the squirrel was electrocuted. January 10, 2008 Posted by oldstersview | animals	| Comments Off on The squirrel thought it was a serious problem.